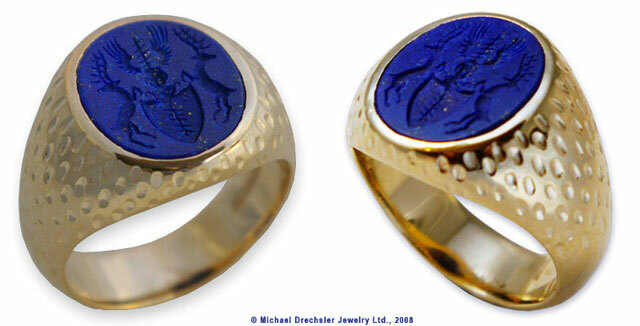 This ring features a 14 x 16 millimeter, lapis lazuli gemstone, carved with a family coat of arms with set in 14 Karat gold. Also shown is a matching carved lapis lazuli pendant set with diamonds. Lapis lazuli is a stone prized since antiquity for its intense blue color. The finest color is intense blue, lightly dusted with small flecks of golden pyrite. Lapis lazuli has been mined in the Badakhshan province of Afghanistan for 6,500 years. Trade in the stone is ancient enough for lapis jewelry to have been found at Predynastic Egyptian sites, and lapis beads at neolithic burials in Mehrgarh, the Caucasus, and even as far from Afghanistan as Mauritania.